I have 20GB for my Mint-KDE 18 root partition. There is no extra home partition. I am doing nothing special, just Chrome, KRDC, Teamviewer and the partition was half empty. One thing I did was copying in Dolphin from webdavs repo on the internet to my network drive via samba. Nothing was stored on my PC. Now I got the message that my disk is full. When I open my root or home directory in Dolphin it says 0 MB free. What is the fastest way via terminal to view my directories and files, biggest first or newest etc? to only see the ones taking a couple GB or more. which will show all files in and below your root directory that are 1G or over in size. ** note that you might need to prepend sudo to the commands above. Instead of all the manual commands in the other answers, I recommend a tool specifically built for this purpose: ncdu, install with the package manager of your choice. It only is a small command line utility, so you should be able to install, when you just make a little bit space. to analyze the entire system. du without options lists all subdirectories and their sizes. sort sorts by size. n asks for a numerical sort. r reverses the result to largest first. head -20 limits the output to 20 lines. By listing directories instead of files, you will find directories that contains a large number of small files. For sort to work properly we can't use human-readable output, but the largest is the largest even if you can't quite parse its size. Before running the more time-consuming du -h command suggested by others, have a look at some folders you can clear easily and often contain junk. You might want to du -h in each of them if they contain a lot of files, before the global du -h.
/var/tmp; but more careful here before, see this page here on the site about how it differs from /tmp. /home/your_user_name - your home directory: you may very well have downloaded some large files here and forgotten about them, or built something which pulls/generates a huge amount of data and doesn't delete it etc. Of course, the files here are mostly ones you placed, so you should know what's safe to delete and what isn't. /opt and /usr/local - not relevant in your specific case, since you indicated you haven't installed anything special, but for other people reading this question - these are typical destinations for installing software that's not part of your Linux distribution. Make sure you actually need that software and are not just keeping it lying around. Use du with the -h --max-depth= parameters (settings of 1 to 3 are useful) to drill down on where space is used. If these numbers do not add up, try stopping non-essential services like web servers, log daemons, nfs (or just reboot) - running processes can take space on the filesystem too by keeping an already unlinked file open (often happens with logging services) and check if the space usage decreases. I think baobab comes standard on Linux Mint. It should let you zero in visually on which directories use the most space. There is a pretty good chance that a lot of it is browser cache. The visual tool will let you interactively see exactly where most of it is. 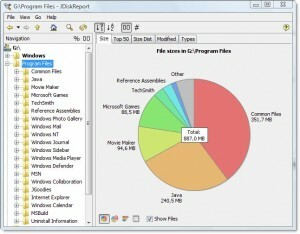 There is a nice piece of cross-platform freeware called JDiskReport which includes a GUI to explore what's taking up all that space. Of course, you'll need to clear up a little bit of space manually before you can download and install it, or download this to a different drive (like a USB thumbdrive). 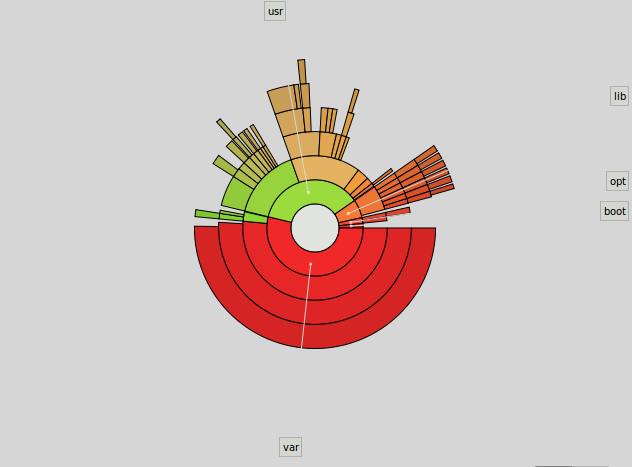 You can use standard tools like find and sort to analyze your disk space usage. I'm late to the party. It seems like everybody has their own favorite version of du | sort with different flags. I got the tip from the book "Linux Server Hacks: 100 Industrial-Strength Tips and Tools" by Rob Flickenger (O'Reilly, 2003). In practice, though, I generally don't get around to aliasing the command because I've used it so many times that I have memorized it. Not the answer you're looking for? Browse other questions tagged files disk-usage or ask your own question. How to understand what's taking up disk space? What is the difference between /tmp and /var/tmp? What's eating my disk space? /var partition gets full what's the solution? How to determine what process is eating up all available disk space?